Wow. Just...wow. 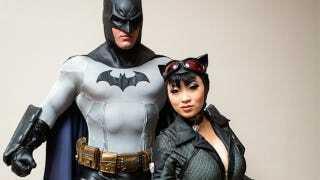 Yaya Han's Catwoman is great, as we've already seen when previously featured, but when paired with that Dark Knight, it just kicks Batman cosplay into a whole new dimension. The giant ears, the texture on the suit, his physique, even the stitching on the front, it's absolutely perfect. If anyone knows who the Batman is, let us know! And for the record, the pic was taken by LJinto, one of the best in the business.